'THE HAREM' - Be whisked away on a magic carpet ride to an Arabian Oasis or a Rajasthani desert stopover in the Dandenong Ranges purpose built for that romantic special occasion or get-a-way. 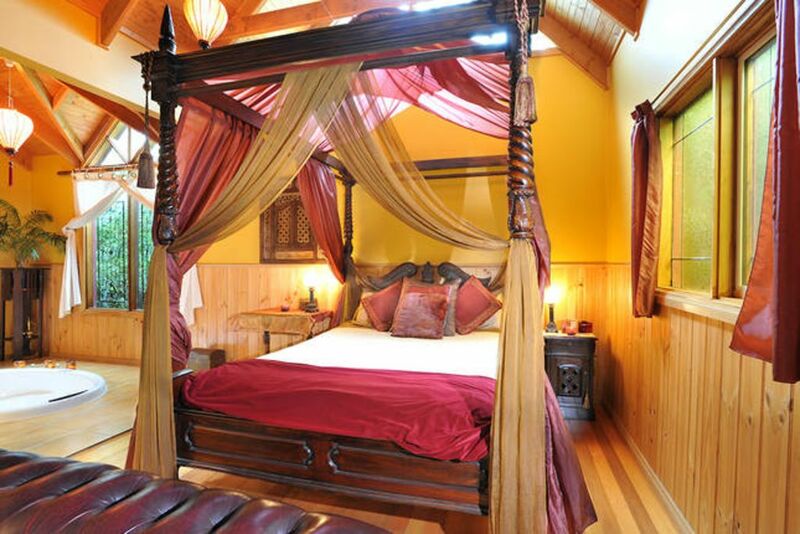 'THE HAREM' cottage: Large two person spa and featured mural is seen from the four poster queen bed which is swathed in drapes and veils of bold spice colours. Exotic lighting, an Indian mirror and stunning soft furnishings add to the romance of this cottage. The wood fire, TV/DVD are also seen from the bed. Full breakfast provisions are left in the cottage to be cooked at your leisure. One Hours Drive From the centre of Melbourne Gembrook Cottages are in Puffing Billy Country, the Yarra Valley and the Dandenong Ranges... the cottages are within easy walking distance of restaurants (including the new Independent), tea-rooms and the walking trails of Gembrook Bushland Park or the Station Masters Walk. Approximately 3km from Forest Edge Restaurant. Pack a picnic and take a trip on the historic Puffing Billy Steam Train, visit local or Yarra Valley wineries. Healesville Wild Life Sanctuary or Ship rock Falls are a short drive away. Fish at the trout or yabby farms, go berry picking (Dec-Mar) Visit Kurth Kiln in the Bunyip State Park as it is all on the door step! Recommend 100 % enjoyed ourselves very much ! My partner and I found it a perfect little get away for the weekend to escape the city ! What a beautiful little cottage in a nice little town ! Arrived to a warm cottage with the fire and music already on for us ! Big beautiful jacuzzi and just gourgous furniture that really compliments the cottage we had a wonderful stay here would definitely recommend to anyone looking for a romantic getaway , we had dinner at the Independent restaurant that was within walking distance the food there was great thanks for the recommendation, we will definitely be back another time soon !! This property is an absolute delight!! It goes on the *Favourites list. Had such a lovely time at gembrook cottages. Me and my partner stayed in 'the harem' was absolutely beautiful. Our stay was so relaxing and we had everything that we needed. With great service! We got there and the mood was already set .. the fireplace was going. Was such a great experience in such a lovely cottage. Will deffinately be returning. Thank you Zaje for the wonderful review. I'm so glad you had a great time and I will look forward to seeing you again.